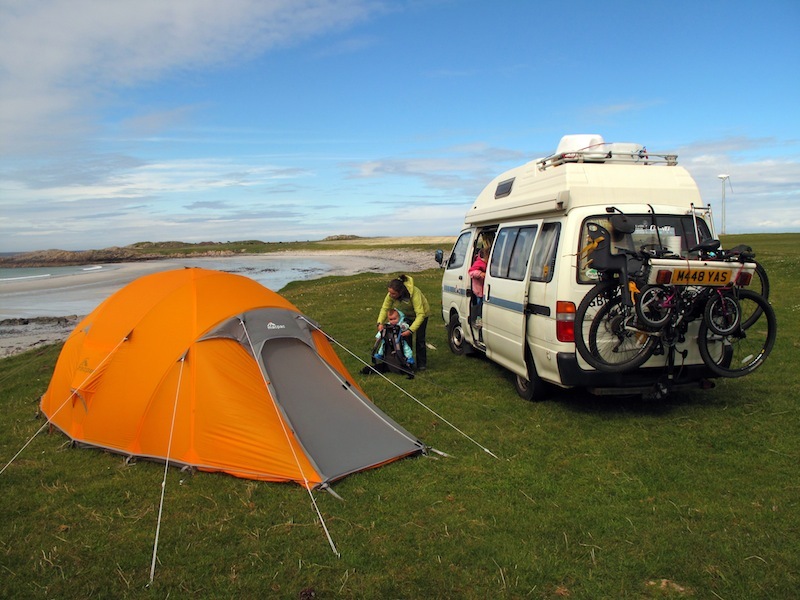 Back in May 2011 I set off with family and friends for a cycling tour to the islands of Col and Tiree. Our visit to Col coincided with severe storms that caused devastation across Scotland, as featured in the 2013 BBC series ‘Hebrides: Islands on the Edge’. I watched the programme with interest because I didn’t see much of the storms at the time due to spending the windiest 6 hours inside my tent , physically pushing the roof upwards in a partially successful attempt to save it from destruction. It survived, but sustained such severe damage that it has never been pitched again. So instead of travelling onwards with our friends to Tiree we stayed on the boat, which serves both islands, and returned to Oban. At the time I was delighted to have been safely evacuated from these windy isles, but over time a sense of dissatisfaction developed at having gone all that way only to dock briefly at Tiree without disembarking, so this year we returned, equipped with a 4 season tent and a camper van, confident that we could handle whatever weather Tiree had in store for us. This time the weather was relatively benign; sunny with a relentless 20 – 30 mph wind. Campervanning is regulated on Tiree; wild parking is prohibited, but for a small(ish) daily fee one gets to choose from 20 or 30 van parking spots. Similar schemes are found outside the UK, for example in North America, and in my opinion they represent the future of campervanning. The vanner gets access to prime spots and an assurance that they will not be crowded out by others; the locals get a small source of additional income and the means to ensure that fragile sites are not spoiled by overuse. 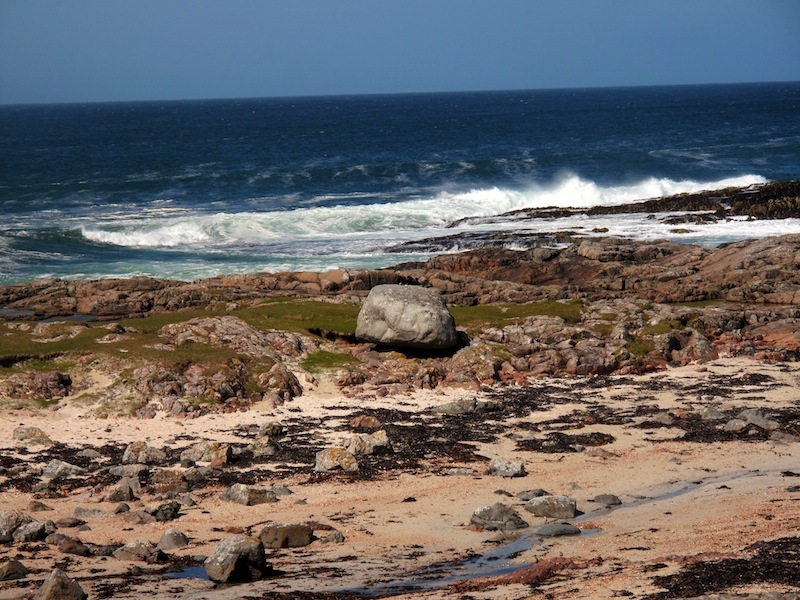 We camped at Balephetrish on the northeast coast, a beautiful spot right on a sandy beach. The Ringing Stone, one of Tiree’s premier tourist attractions, lay a couple of kilometres east of our campsite. It is a glacial erratic transported from Rum, perched on the local rock in such a way that it rings when struck with a stone. Extensive cup-marking shows that it has attracted human interest for millennia. The outdoor media often paint Tiree as a mecca for all forms of surfing, traditional, wind and kite, so I expected to spend the week tripping over salty-haired, VW-driving, doobie-tooting bums, but the reality was somewhat different. Tiree’s population of 700 was augmented by only one would-be kitesurfer that I saw. He seemed able to get his kite into the air and sometimes also managed to get his feet onto his board, but no actual surfing occurred. Perhaps it is busier in the main holiday season. Tiree is important archaeologically. Until recently, the discovery at Balevulin on the west of Tiree of a particular style of flint arrowhead suggested that the island was one of the earliest regions of Scotland to be visited by people after the last ice age, at around 12,000 years ago. (Subsequently Howood farm near Biggar has been dated to around 14,000 years ago. I’ve been following research in this area for a couple of years now – it’s a rapidly evolving field in which the accepted facts often change). In many ways the presence of people on Tiree 12,000 years ago is more remarkable than that of people near Biggar 2000 years earlier, for the Ice Age did not end smoothly. The ice sheets slowly receded from their maximum extent around 22,000 years ago, culminating in a warm period during which wooded steppe spread to the north of Scotland. The Biggar site dates from this warm period. But the ice returned 12,800 years ago in a period known as the Younger Dryas or Loch Lomond Re-advance, and stayed until 11,500 years ago. The ice caps of the Younger Dryas were confined mostly to western Scotland, but cooler conditions meant that the whole of northern Europe lost its tree cover and reverted to steppe-tundra. Also known as mammoth-steppe, this is a landscape that cannot be found in today’s interglacial world. Steppe tundra is a good habitat for reindeer, and the people of present day Germany developed the Ahrensburgian arrowhead in order to hunt them. These arrowheads represented a technological leap forwards; they had a tanged point, meaning that the stone was worked into a classic arrow shape with a pointy end and a straight section behind. It is claimed that arrowheads of this style have been found in Islay, Jura, Wester Ross and Orkney. The Islay finds are disputed, the Orkney specimens have disappeared, the exact circumstances of the Tiree find cannot be verified. The Wester Ross arrowheads are the most convincing, and if the hunters made it that far north then surely it is credible that the more southern finds are also genuine. The extent to which the more local ice sheets had depressed the land beneath, and the extent to which this local depression had elevated the land more remote from them. I find it fascinating to consider how different the landscape was back then, and tempting to speculate as to the similarities between those first reindeer hunters and ourselves. They were after all the modern people of their time, doing what was required to make a living, equipped with the very latest technology. 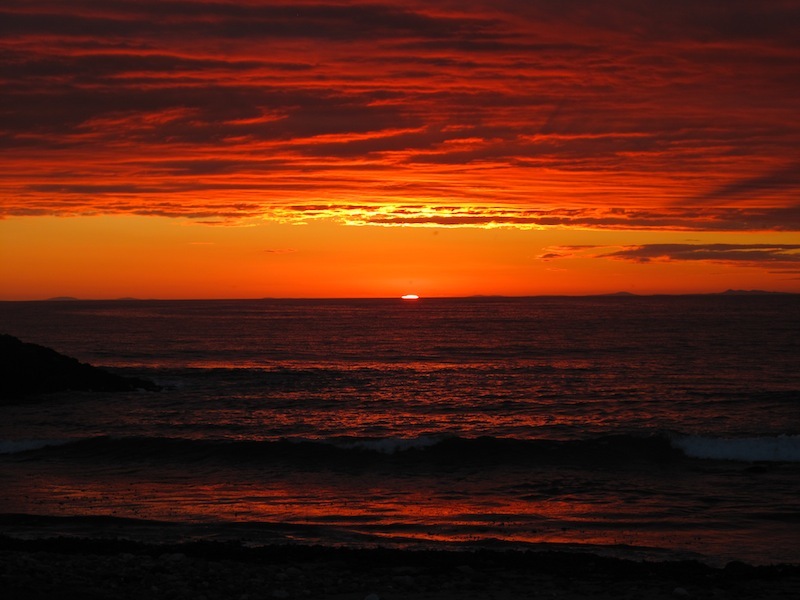 Was the satisfaction and joy they felt as they sat down with full stomachs to watch the sun setting over the Outer Hebrides any different from my own?